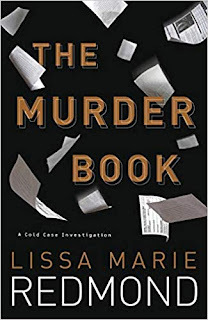 Lissa Marie Redmond, a retired cold case detective for the Buffalo Police Dept., returns with the second book in her Cold Case Investigation series, The Murder Book. Police detective Lauren Riley, who made some bad decisions in the first book, A Cold Day in Hell, is still suffering from the consequences of her actions. However, when she's attacked in the office at work, it has nothing to do with her past. Shane Reese, Lauren's partner, clocks out, leaving her alone in the darkened cold case office. He's only gone for minutes, when she's struck down from behind. Two days later, she wakes in the hospital. She doesn't even know she was stabbed. She does know someone kicked her in the head, with police-issued boots. She knows she was attacked by a cop. Because the murder book, the index of cold cases, is missing, she and Shane are convinced someone is trying to cover up an old case. Lauren's on medical leave, and isn't even supposed to drive, but she teams up with Reese to mount their own investigation. The two detectives go rogue, asking questions of people they trust, and sneaking into Homicide headquarters so they can "borrow" a file. But, it's the district attorney that provides them with the information about a call on a tip line. With the help of a retired cop, Lauren and Shane set out to find a dirty cop. Redmond melds a fast-paced police procedural with a study of a flawed detective, Lauren Riley. She's made a number of bad decisions in the past, and, as mentioned, she's still dealing with the repercussions of the latest one. There's a psychopath who is fascinated with her. He's an ongoing character, and that storyline is left hanging for future books. Let's hope there are future books. Redmond's The Murder Book is published by Midnight Ink, a publishing house that will be shut down mid-year. The intriguing series, written by a knowledgeable detective, deserves to find a new home. The Murder Book: A Cold Case Investigation by Lisa Marie Redmond. Midnight Ink, 2019. ISBN 9780738754277 (paperback), 288p. FTC Full Disclosure - I received a copy of the book to review for a journal. number three is scheduled to be pubbed by Midnight Ink before it closes. I'm so glad Terri dropped by to say number three is scheduled. That's good news for readers. Thank you, Kay, and thank you, Terri.